Well, that’s it. Osaka is over. Air Canada decided to cancel the route as of October 23rd and I finished my last flight there on the 12th. My flying life will now radically change and therefore the rest of my life will have to adapt. This is not a prospect I look forward to but I don’t dread it as badly as I had feared. I have used the looming changes to really savour my current blessings and to let them go as gently as possible. When I first heard about the cancellation of the route, and then the impending layoff of 600 flight attendants, I felt sick to my stomach but I made a decision to just enjoy my last few trips as much as possible and to let the future take care of itself- it was out of my control. As I have said in past blogs, I believe that everything happens for a reason. One door shuts another door opens. Unfortunately, most of us are so busy still pounding on the door that shut behind us, we don’t notice the new one that opened. One of the Yamas- or restraints- of yogic philosophy is aparigraha– non-clinging or non-possessiveness. It has been interpreted to mean an absence of greed, an abstinence from materialism among other things. I have thought of it as beyond just clinging to material things, but to things that naturally change in our lives. We become so set in our routines and what we think is our “right” that when anything upsets that, we become panicky and fearful. (I mean… I could start speaking on the current economic situations in the world and you would have a ten page diatribe on how we got there because we cannot practice aparigraha but I will leave that to the yogic economists out there…) I chose instead to embrace the present and look for the new door when this one closed. What an amazing last few trips it was! I think I gained 10 pounds from all the food I ate. I visited all my favorite establishments that I had come to know over the last twelve years and dined on gourmet noodles, sticky rice sweets, excellent sake and of course my wonderful coffee. I took small gifts of chocolates and cookies to all the shop keepers who called me a “regular”. The Japanese are serious about how they define their customers- being called a regular was an honour usually reserved for local Japanese- not for a foreignor that popped in once or twice a month. Many of them gave me little gifts back- a bottle of homemade soy sauce, a little trinket for my bag. It was sad and wonderful all at the same time. 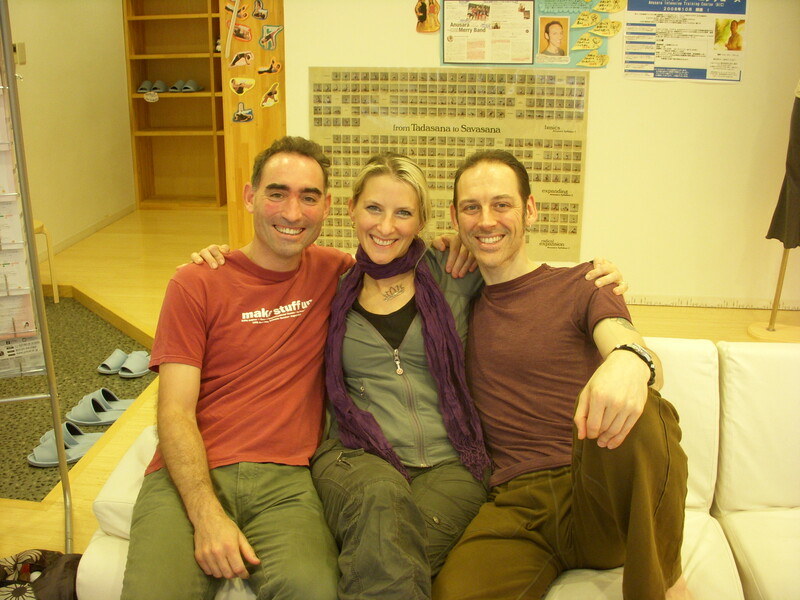 I was happy to be able to mix my yoga practice into the ritual of saying goodbye because as my door on Kansai closed, it was just opening for my friend Mark. Mark has relocated from San Francisco to Kyoto as the newest teacher at Studio Yoggy. Mark and I met back in June in Yokohama and fast became friends. His Japanese is progressing at an astounding rate and he is doing most of his class in Japanese. This is no small feat in Anusara where we mix philosphy into the physical practice. Mark moved to Japan just before my last two flights so I decided to catch a couple of his classes during layover. The first layover Mark was teaching in Osaka. “Nice and close”, I thought. Well…. Come on. Was this seriously happening? Both of us lost? I jokingly told her that if Mark didn’t show up I could teach. The next thing I knew they handed me the phone to talk to one of the managers , my friend Tomoko, and I was asked to teach if Mark didn’t show up in 10 minutes. Talk about a strange morning. Well ten minutes later I started my impromptu yoga class, withno prep, and 30 minutes later a very flustered Mark came into the studio. The poor guy- in ten years of teaching he had never once been late- he was beside himself. All ended well. I was payed back for my class fee- given a free class for the next week in Kyoto and payed for teaching the class as well! Mark even bought me lunch and we had a good laugh over how the universe likes to mess with you just to keep you on your toes! The last trip to Osaka was the best- the most satisfying in so many ways. I started out with a late arrival into Osaka and ran in full uniform to my favorite massage place. They had been wondering where I was ( I don’t make an appointment in case of flight delays) and had just enough time to book me for what I call heaven- an hour and a half aromatherapy oil massage. As you can see from the pictures they are tiny but man are they powerful- it’s like they hone in on all the painful tight places. Like I said heaven- in a sadistic kind of way. Panekea Hands Massage- the best! I woke up early the next morning to hop the train to Kyoto. The sun was shining so bright and it was slightly cool- just enough to tell your senses that it was becoming fall. I arrived in Kyoto to start my morning walk up Higashiyama- the same place I spent time in last New Year. The weather was perfect and the sun was becoming warmer as I climbed through the meandering streets. I took in every colour, every texture, every scent as I weaved further up the mountain. I stopped in front of a door way just to admire the simplicity and the textures that were contained in no more than 4 feet. 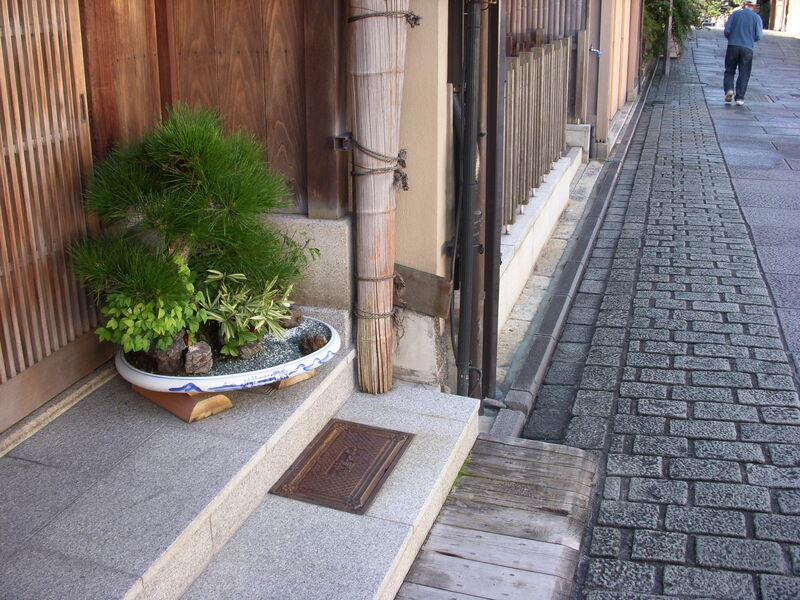 A stone road led to a cobbled brick shoulder to a wooden ramp to another stone step upon which sat a bonsai in blue and white ceramic . Two wooden half circles supported the bowl and in behind was a wrapping of straw and framing the whole vignette was a slatted wooden door. So simple, so natural and yet so rich. It completely entranced me. I climbed higher and higher to finally come to my favorite temple, Kiyomizu. Like a grand wooden tree house it seems to float on the mountain side. I came into the main part of the temple to pray and noticed my dragon fountain was out of order but was curious as to what seemed to be a special event going on. I asked one of the Japanese volunteers what was going on and he explained that the image of the Kannonwhich is housed inside the Hondo or main hall- was open to public viewing today. She would only be open until November then again in March and then they would close the doors on her sacred container to not be opened again for 25 years. It was the most magnificent hall- lit very softly along the sides. There must have been 50 statues of different gods and demons that protect the Kannon and all around them were hundreds of candles. Similar to lighting candles in church , in Japan you also light candles for those you wish to help or protect. The candles had paper wrapped around the bottom and you could purchase one, write your blessing on the paper and then light it and place it all around the figures in the shrine. Unfortunately due to the age of the relics no pictures are allowed so you will just have to go there yourself! I would suggest this November or next March as 25 years is a bit of a wait…. I wandered back down the mountain to make my way to Mark’s yoga class in Kyoto. He was very punctual and had prepared a wonderful class. Tim, a mutual friend that I had also met in June, was also there so that was a treat. My only regret is that if I had continued that route I could have taken more classes from Mark- I learned so much from him in even that short time. Aki, another teacher who I met last year in Japan, was also there and we rocked out astavakrasana in front of the amazing studio wall. She laughed and agreed that the studio was quintessential Kyoto ” Kyoto-poi“. I felt so blessed to see old friends and have them, and my yoga, as part of my last day. I went home with my fantastic crew and I felt deeply satisfied with how I chose to say goodbye. In Japanese when you are completely full, nothing more can be added to the experience you say ” dai-manzoku“. It really couldn’t have been better and now I am looking for the next door. Bye bye Kansai!